PatchFactory is provided as "try-before-you-buy" software, you can evaluate it 30 days for free. When this period expires you must either purchase our software or stop using it and remove it from your computer. DF SDK is available for free download as a Demo containing all main features provided in the full version package. As soon as we are notified that your order has been processed, a registration key and product activation instructions will be sent to you via email within 24 hours or one business day to unlock your copy of software (during business hours, orders are usually processed within 2 to 4 hours). To buy our software you can use one of our secure payment processing services: ShareIt!, or RegNow (services of Digital River) which are industry leaders in E-Commerce Payment Processing Services. All data exchanged during the payment process is SSL-secured and protected with a high level of encryption. For more information on the security policy, please look at Privacy Statements of ShareIt! and RegNow. The simplest and cheapest way to buy our software is to order it Online. Our registration services currently accept the following bank cards: Visa, Mastercard/Eurocard, American Express, Discover/Novus, JCB, Diners Club. You can also order by Cheque, Cash, Fax, Postal mail, Fax&Phone, Bank/Wire Transfer, Purchase Order/Invoice or via PayPal - check links within the online secure order form. Do not forget to supply exact Personal info and a valid e-mail address to which we can send your registration & update information. Customer's information is considered confidential and will NOT be shared/distributed to any third party. Please, click on the appropriate price link in the table below for placing your order. Add AgenSoft Products CD-ROM to your purchase (shipped via Air Mail - currently for ShareIt orders only). CD-ROM is free if buying a Commercial or a Corporate license, and 9.95$ (9.95€) value for a Personal license. NOTE: DF SDK source code can be provided only with Commercial or Corporate license for additional payment. * You can take advantage of the special Upgrade price only if you already own PatchFactory 1.x or 2.x. The discounted Personal License is offered as a service to the industry, primarily for single person companies with little revenue (such as shareware authors). The software is licensed to the name of the individual purchasing the license. The standard Commercial License is intended for small companies. The software is licensed to the name of the company purchasing the license. Maximum number of employees using the software is limited to 5. It also entitles an organization to receive high-priority support (with guaranteed answer within 2 business days) via email. If you would like to obtain more extended services or more employees to use the software - consider buying the Corporate license. The premium Corporate License is intended for large companies and corporates with many employees. The software is licensed to the name of the company purchasing the license. And besides this type of license entitles an organization to receive one copy of the distribution software and to duplicate the software for any number of people or workstations within the corporation. It also entitles an organization to receive high-priority support (with guaranteed answer within 1 business day) via email and free major version upgrades during lifetime of the product. All licenses include the royalty-free distribution of modules marked as redistributables both for you and your customers (created patch packages for PatchFactory and redistributable libraries for DF SDK) for an unlimited number of applications, free minor version updates with special 50% discount for major upgrades during lifetime of the product and high-priority technical support via email and public support forums. Money back guarantee: We offer a 30-day money back guarantee on all our software. If you are not completely satisfied with your purchase, we will refund its total price excepting shipping fees within 30 days of receipt. Registration renewal: to renew your previous version registration you can use the appropriate discounted upgrade link from the table above. As soon as your payment is processed and we check your registration info, a new registration key (or new full version) will be sent to you via email to unlock your copy of AgenSoft software. Major version upgrade is offered to our current customers (Personal and Commercial licenses) on a paid basis at a discounted rate (50% discount). Corporate customers receive any version updates & upgrades free of charge during lifetime of the product. Additionally if you have bought PatchFactory v2.x after first beta release of PatchFactory v3.0 RC1 (18 March, 2005) then you will have to pay only 25% of the full license price. Competitive Upgrade: up to 50% OFF for migration to PatchFactory or DF SDK. 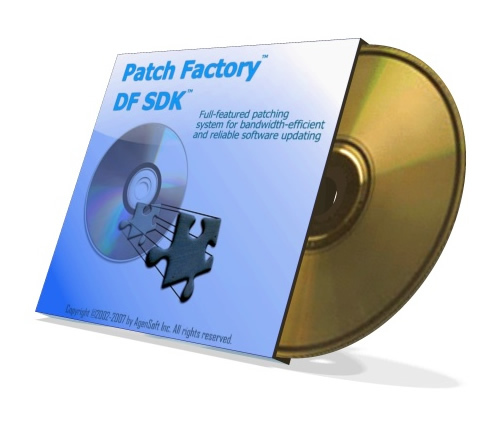 If you have previously purchased an updating solution and have experienced any options, performance, or reliability issues, AgenSoft offers you the chance to upgrade from your current vendor's software to PatchFactory or DF SDK. Please forward a copy of the order confirming your purchase of that updating software to our Sales Team and we'll gladly e-mail you special instructions to obtain your upgrade (do not forget to indicate which product you have selected - PatchFactory of DF SDK). License Upgrade: if you have previously purchased PatchFactory or DF SDK then you are entitled for discounted license upgrades (the sum of your previous purchase will be subtracted from the total sum in case of license upgrading). So that, for instance, if you have previously bought PatchFactory v3 Personal License and you would like to upgrade it up to Commercial - then you will have to pay only the cost difference. Please forward a copy of your ordering information confirming your purchase at and we'll gladly e-mail you special instructions to obtain your license upgrade. "Free minor version updates" means that by purchasing version 3.0, you have also purchased 3.1, 3.2 and all other 3.x versions, but not version 4.0 and later. However, you will get free major version update if it has passed less than 3 months since the date of your purchase. Custom Development: AgenSoft.Com has a team of experienced software developers and a powerful resource base to provide your company with individual solutions based on PatchFactory or DF SDK. The technology used enables us to create cost-effective program solutions within a minimum period of time. Write to us about your problem and we'll inform you about the working schedule and the approximate cost. Please, contact us at for further information. Royalty-free distribution of created patches for an unlimited number of applications (PatchFactory). Royalty-free distribution of modules marked as redistributables in your applications (DF SDK). Free minor version updates during lifetime of the product. Removal of the 30-day trial and functional limitations, if any (PatchFactory). Free reissue of the registration key if lost. Free Technical Support (according to the type of the license you have bought). Discounted License Upgrade and Registration Renewal price. * To get an access to the hidden area, please specify the Email address you used when ordering to register at our Support Forums, this will provide you with an access to the restricted area containing the latest bug-fixes and minor updates which are not included into the the current release, and not available for non-registered users). If you experience any problems during Ordering process, please visit our FAQs and Ordering Problem Page first. If you don't find an answer there - feel free to contact us. You can use our online email-form (guarantees that your email will reach our Support Team) to get in touch with AgenSoft.Com Support Team (using the online email-form guarantees that your message is received). ShareIt! (Köln, Germany). Billing Currency: EUR, USD, GBP, AUD and others. Payment options: Major Credit/Debit Cards, Check/Money Order, Postal mail, Bank/Wire Transfer, Fax&Phone Ordering. Language: Multilingual. Please, visit ShareIt Customer Care Center for ordering details. RegNow (Issaquah, Washington, USA). Billing Currency: USD, EUR, GBP, AUD and others. Payment options: Major Credit/Debit Cards, Check/Money Order, Postal mail, Fax&Phone Ordering, Bank/Wire Transfer, PayPal, Invoice/Purchase Order. Language: Multilingual. Please, visit RegNow Shopper Support for ordering details.